A pressure washer solves many cleaning dilemmas such as hard water and more. A top-quality piece of equipment that is ideal for cleaning a multitude of things such as vehicles, residential and commercial power washer units are designed to work in conjunction with other kinds of power washing equipment. This type of equipment can be used to clean, boats, driveways, vehicles, jet skis, snowmobiles, pools, patios, trailers and more. 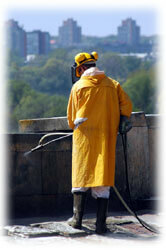 Industrial and higher end power washers are designed to handle the pressure washing of bricks and garage doors. From slaughterhouse floors to brick storefronts, as well as things like industrial dumpsters, vehicle fleets, parking areas, entire buildings, greasy machines, engines and agricultural equipment, pressure washers can do just about anything. As great as these machines are, though, there is danger of the high pressure water coming into contact with workers who deal with power washers. A worker who deals with this type of equipment should follow safety in the workplace tips to prevent an accident from the high pressure water that comes out. In performing any of the above mentioned jobs, there are certain safety in the workplace tips to follow to ensure the safe handling of these high powered pieces of equipment. There is a series of steps that should be followed that go along with completing the cleaning process in a safe and secure manner. First, wear the proper equipment. There are several pieces of workplace safety gear that are responsible for ensuring the protection of workers who deal with high-powered pressure washers. Some of the safety accessories are industrial duty gloves, security hard hats, ear muffs, safety vests with a vertical stripes, and rain suits. The material you wear, though, isn’t all you’ll need. Remember to bring a safety cone and a first aid kit. When using the equipment that goes with your pressure washer or the device itself, it is best to wear rubber boots that have non-slip protection and steel toes. When a worker is applying solvents to the material that must be cleaned, it is important to wear the correct method of hand protection. Any clothing that becomes saturated from solvents should be removed immediately. A strong soap is needed along with water if your skin has come into contact with solvents. In addition to having the right gear, there are several other things to keep in mind. When using pressure washing equipment, be aware of the possibility of hot-water based burns as well as the dirt particles or water coming back at you as you blast that water. Never point the force of the water at others or at yourself. When removing grease or oil from your hands, use a waterless cleanser or soap and water. Do not use solvents. Other safety in the workplace tips include wearing gloves at all times. There are often sharp bits here and there that you’ll be cleaning. If you do happen to come across something that is sharp, be sure to cover it with a grease rag, some tape or a shim to protect yourself. It is crucial to steer clear of anything electrical like an outlet or a light as you spray. Also, make sure that there is proper ventilation should you choose to go the route of a gas washer inside a building or warehouse, as the fumes could hit you fairly quickly. All of these safety in the workplac tips should be followed to a “T” when using a pressure washer. Workers who use a pressure washer should have access to the pieces of safety equipment that can be used in conjunction with a pressure washer, and it is very important to follow each of these workplace safety tips.